(Darius Shahtahmasebi) Following Michael Flynn’s forced resignation as Donald Trump’s national security advisor, it seemed as though neoconservatives had completely infiltrated the Trump administration. Flynn’s replacement is a staunch anti-Russian imperialist, General H.R. McMaster. In his new post, McMaster went to work immediately and began to shake up Trump’s National Security Council, including booting the president’s chief strategist, Stephen Bannon, off the council. Not long after, McMaster briefed Trump on military strike proposals against the Syrian government, something Bannon would have completely opposed. “Bannon is a core architect of ‘America first’ unilateralism and has no interest in continuing forever-wars that lack support among the base in the region,” said Ian Bremmer, the president of the international consulting firm Eurasia Group. However, things have not gone so smoothly for McMaster despite his keen insistence on playing such a prominent role within the Trump administration. His military strike proposals — troop deployment proposals, unannounced trips to Afghanistan, and his overhyped portrayal in the media as “an accomplished military strategist and an adept White House infighter” — may be short-lived if Bannon and Bannon’s loyalists have any say in the matter. According to Foreign Policy, there are opponents of McMaster within the White House who want him out. Supposedly, the efforts to derail McMaster through anonymous leaks to the press (ironically, how McMaster secured his job in the first place), focus on McMaster’s policy towards Afghanistan, which could see an additional 5,000 troops deployed to the war-torn nation. “McMaster is pushing this Afghanistan policy through. I think some people are giving him the rope to get it through, hoping he hangs himself with it,” one senior intelligence official said, as reported by Foreign Policy. McMaster’s strategy would give overwhelming power to the Pentagon to determine troop levels, as well as broader authority to use airstrikes. Apparently, increasing troops incessantly and bombing Afghanistan into oblivion hasn’t been tried enough in the past. This is in light of the fact that, according to Lake’s sources, Trump has privately expressed regret for choosing McMaster. As much as the neoconservatives would like to think that by swamping Trump they can officially dictate his actions, Trump was always going to be the unscripted “wildcard” president. Easily swayed by emotion, with a brain completely detached from his own mouth, Trump was never going to satisfy both camps vying for control of his decision-making. For example, the president recently displayed a brilliant Trump-esque moment reminiscent of his election campaign when he announced that the missile defense system he deployed to South Korea (known as THAAD) would have to be paid for by South Korea. According to Lake’s informants, this is not an isolated incident. Lake noted that over the weekend, McMaster did not accompany Trump to meet with Australian prime minister Michael Turnbull but was accompanied by the outgoing deputy national security advisor, K.T. McFarland, instead. As Foreign Policy reports, the National Security Council is still full of “Flynnstones,” a nickname given to people hand-picked to serve on the Council by McMaster’s predecessor, Michael Flynn. In that sense, McFarland is seen as a nuisance to the McMaster camp, yet not even Trump supports McFarland’s removal, as he “likes McFarland and has openly questioned why she’s leaving,” according to Foreign Policy. Unless McMaster can completely shake the council up in his image, there will always be infighting between these two camps. 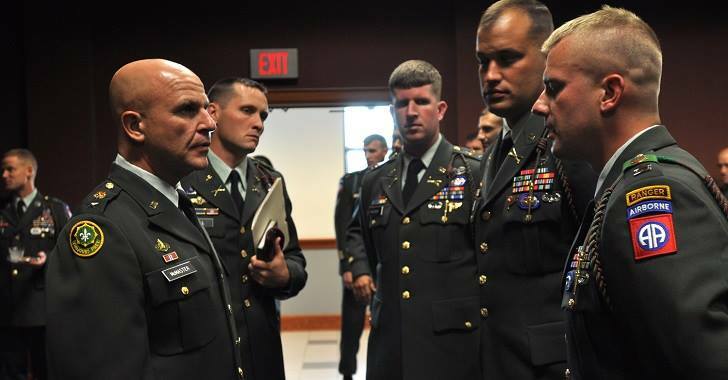 Further, McMaster is an active-duty three-star general, overseeing a cabinet and military filled with four-star generals. As Lake reported, a Flynnstone named Derek Harvey compiled a list of “Obama holdovers at the National Security Council who were suspected of leaking to the press.” Bannon and Trump pushed McMaster to fire these people but McMaster refused.